Organisers of Gwynedd's Festival No.6 say this year's event will be the last "for the time being". The festival, which has been held in Portmeirion since 2012, has won numerous awards and international recognition for its mix of art, music, food and culture. The event this year includes Franz Ferdinand and Jessie Ware. The organisers said a hiatus will give them the opportunity to plan for the future. Over the years, the event has welcomed stars including Noel Gallagher, Pet Shop Boys and Mark Ronson, as well as Welsh singers, artists and writers. 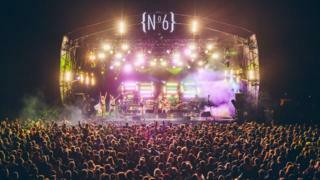 In a statement, the organisers said: "No.6 has always been more than just a music and arts festival. "In six short years, the profile of the festival has far outgrown its intimate capacity, picking up numerous awards, gaining international recognition and becoming one of the world's most unique festivals. "We always knew we had something special but we never quite expected it to capture people's imagination the way it has. "Unfortunately, No.6 is just not sustainable in its current format and so we've made the difficult decision to take a breather - 2018 will be the last Festival No.6 for now. "Taking a break is the right decision but not all is lost, we're already thinking about the future." The festival runs from 7-9 September this year.